Food. Harry Potter. and The Little Mermaid. Can we just take a moment and weep openly at the wondrous sight that is this cake? 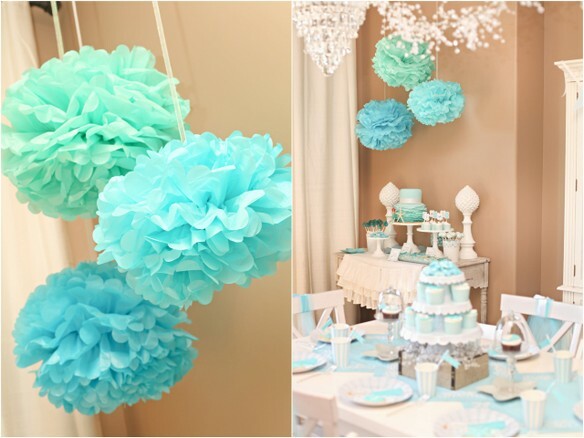 You can just feel the ocean’s ebb and flow in those adorable ruffles. 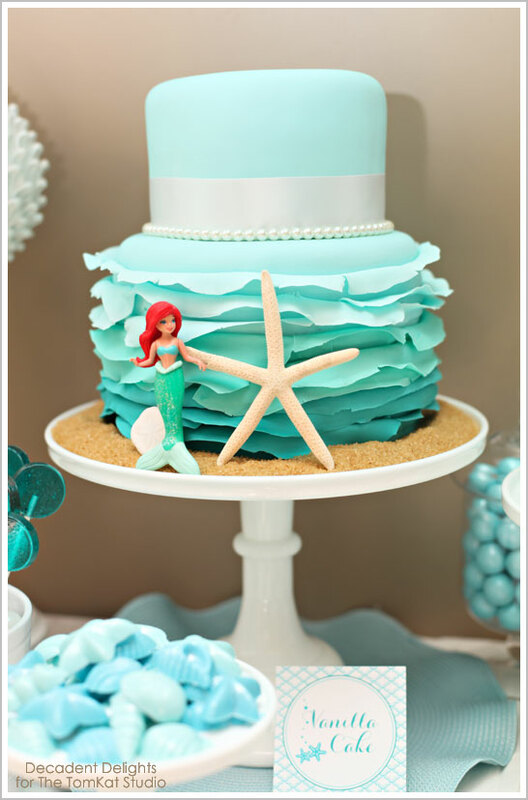 And the Ariel doll, starfish, and pearl strand for garnish. Come on. You’re killing me. 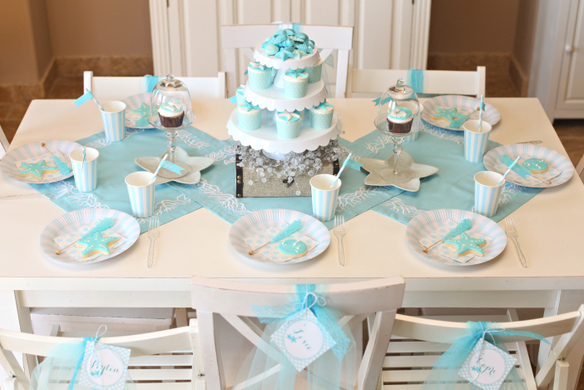 Every single detail of this party made me swoon. 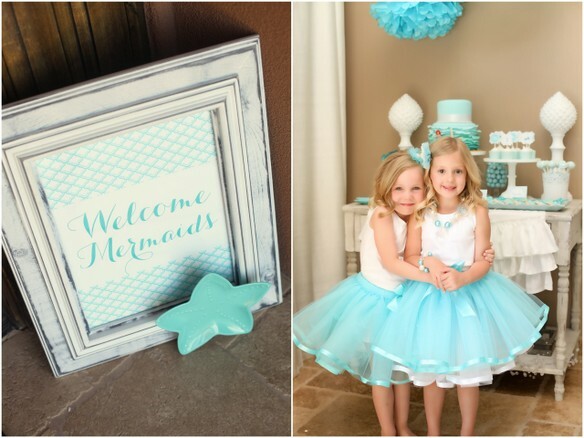 I especially love all the teal paper goods available from Kim’s shop! 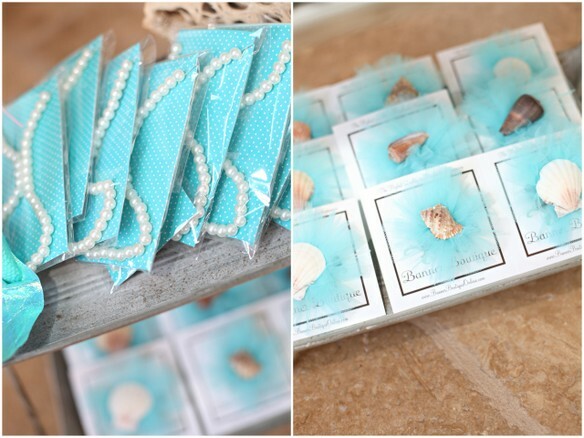 Each little mermaid at the party got these sweet seashell hair clips, bubbly jewelry and little teal tutus. I bought little Squinkies Ariel rings for the girls as party favors (multi-pack at Target) and tried to think of a creative way to package them, since they are so tiny. I had one of our mini candy jars sitting on my desk and decided it would be cute to fill them with sand (raw sugar) and put the ring and some mini shells in it to create a little beach scene. Since the jars are glass, I waited to hand them out to the parents when they picked up so they could help get the ring out and handle the jar. 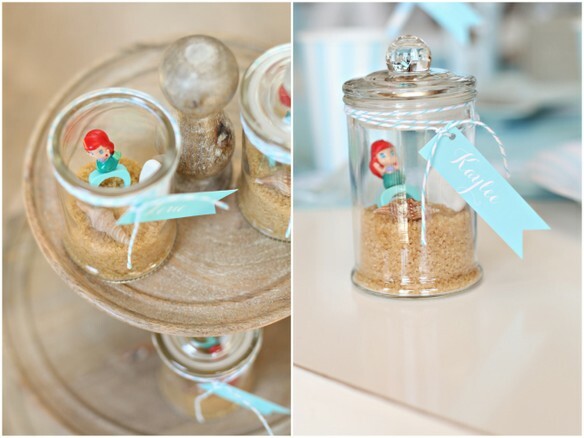 Kate’s little jar is sitting on her dresser and it’s a perfect keepsake from her mermaid party! So cute right? If you want to read the whole post, Click here! Do you have any Sweet Celebrations you’d love to share? Drop them in the comments!